The words “healthy” and “holiday” simply don’t belong in the same sentence, right? Part of the joy of the holiday season is not only getting to spend time with our loved ones, but also the ability to bond over great food. Whether your weakness is stuffing, cranberry sauce, or a heaping slice of pumpkin pie, there’s temptation everywhere threatening to derail even our best efforts to eat well and maintain a healthy diet. While staying healthy during the holidays can sometimes feel like an impossible task, we promise it’s not nearly as hard as it sounds. Trust us, we’ve got a few healthy holiday tips up our sleeve to help you stay on track this season. Believe it or not, you can even still savor some of your favorite seasonal treats. Just see for yourself below. What would our healthy holiday tips list be without mention of moderation? No food is so terrible that you can’t have it every once in awhile. That being said, it’s important to practice portion control during the holidays, and only eat until you’re full. Holidays like Thanksgiving often end in overeating due to the massive amounts of delicious food. So savor every bite, and walk away when when your stomach’s full…not necessarily when your plate is empty. You may be surprised to learn just how many substitutions are out there for the unhealthy ingredients in your favorite hearty recipes. For example, all that butter that goes into those delicious chocolate chip cookies? We bet you never even thought twice about substituting it for applesauce. And how about those mashed potatoes? There are plenty of mean recipes for vegetarian cauliflower versions online. You understandably won’t want to lighten up every one of your favorite holiday recipes. Sometimes, you just can’t beat the real thing. However, making a few small changes in your holiday cooking routine really can make all the difference. Choose which holiday gatherings are most important to you to indulge in when it comes to the food. You can always eat before a celebration and lightly snack during the actual event, saving your real cheat meal for the holiday. Last but not least, make sure to balance out your favorite holiday treats with healthier options too. If you know you’re going to go all out on Thanksgiving for example, try to eat lighter during the week and before that meal. Choose healthy options like lean proteins, veggies, and fruits to fill you up, and you’ll feel no guilt when it comes to a little indulgence during your holiday celebrations. Do you struggle with staying healthy during the holidays? 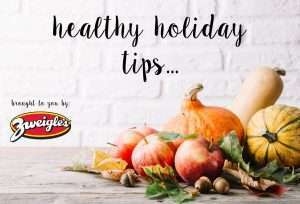 What are your favorite healthy holiday tips?